Churros are fritter-like, donut-like, pastry-like foods that have a Spanish origin. It turns out that Churros are a pretty easy treat to make with the right technique and supplies available here at ABestKitchen. At home, you can make churros with a pastry bag using a large star tip to make your dough/batter into the typical churro shape. In a commercial setting, or at your neighborhood fiesta, you can increase production using a churro maker, pictured here. This is our smallest commercial model that is designed for home-use as well. For even larger productions, several larger sizes are available for even higher food productions in bakeries, food trucks, or restaurants. The basic technique is to create a batter or dough using flour, butter, water, sugar, eggs, and sometimes cinnamon or other sweet additions. You create the dough by heating a mixture of the butter, flour, water, salt, and sugar in a pan until it forms a thicker dough-like substance and then whisking in the eggs until you have a kind of thick batter that can be pressed through the pastry bag or through the churro machine into a pan of hot oil, cutting them off into equal length pieces and then frying them until golden brown in a pan of hot oil. You can then remove the churros from the hot oil using a stainless steel slotted spoon or tongs, and roll them in a mixture of sugar and cinnamon, if desired. They are also often also drizzled with chocolate when used as a dessert. These pastry treats are not always dessert though – they are often eaten for breakfast too. For serving large quantities of churros, the ingredients are not very expensive so at your restaurant, bakery, or fiesta, churros can be a cost effective or highly profitable food. There are also churros that are stuffed with a sweet filling. Our churro makers have nozzle adapters that can make the hollowed out shape, which you can later fill with your favorite sweet icing, chocolate, or filler. 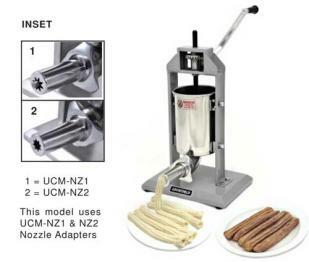 You can use a churro filler, which is actually a pastry filler that can be used to fill donuts or other pastries too. Otherwise, the pastry bag will do the filling job using a different narrow tip. This entry was posted in Food & Eating, Foodservice. Bookmark the permalink.